" MANAFORT CONVICTED, COHEN PLEADS GUILTY; Also: What's the Matter With Kansas Elections (And Everyone Else's)? 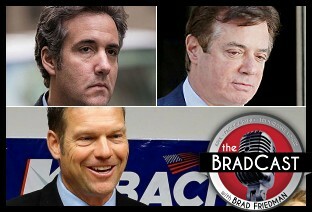 : 'BradCast' 8/21/2018	"
« PREVIOUS STORY "'Green News Report' - August 21, 2018"
"MANAFORT CONVICTED, COHEN PLEADS GUILTY; Also: What's the Matter With Kansas Elections (And Everyone Else's)? : 'BradCast' 8/21/2018"
This compulsive copyeditor is obliged to note that Jennifer Cohn's last name is misspelled as Cohen in the subtitle. Can't help myself. Thank you, compulsive copyeditor! And I was trying to be very careful about that given I had to discuss both Jenny Cohn AND Michael Cohen on today's show! I almost got it all right!